Rotork has a wealth of experience in fitting actuators to valves, penstocks or dampers that are already installed on a plant. Whether a customer is replacing obsolete actuators, changing power source or motorising manual valves we are able to offer tailor made solutions designed to comply with our customers' requirements. Retrofitting actuators to valves installed in the pipeline is a safe and cost effective solution that minimises plant disruption. Working from basic valve data we are able to offer a full sizing service that matches actuator models to the valves’ requirements. 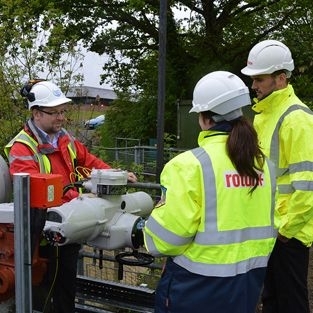 We carry out full and detailed site surveys, collecting all the dimensions needed to design the mechanical components that will mount the new actuator to the existing valve. The installation, commissioning and operation of the actuator is covered by Rotork standard warranty terms.